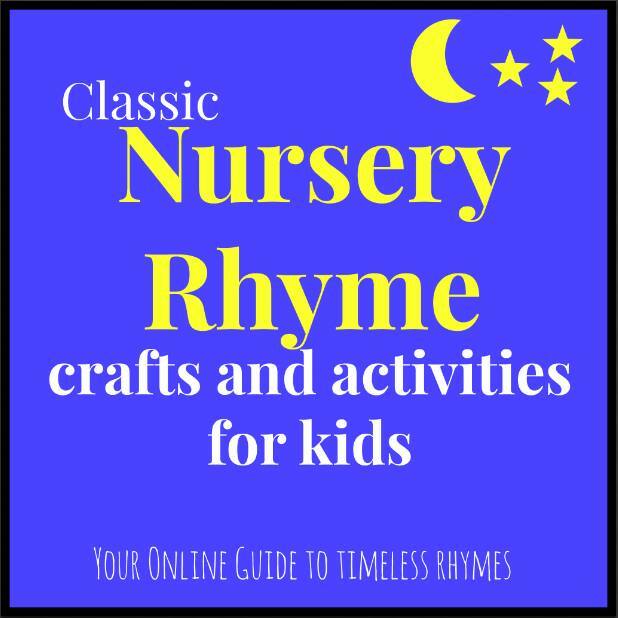 Did you know this week is World Nursery Rhyme Week? Fun right? We have had fun in our house with our book related activities and nursery rhymes fall in that group for us, since we most often read rather than sing our nursery rhymes. 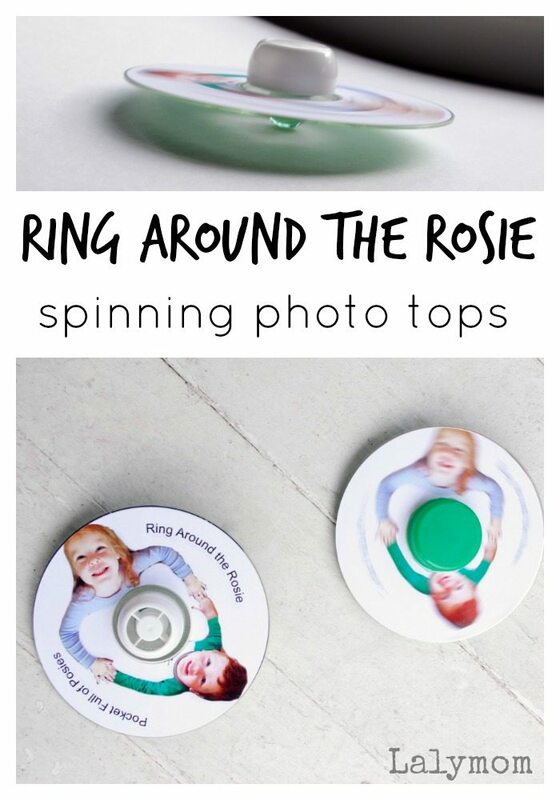 Today I have another DIY Toy to go with a nursery rhyme, it's a Ring Around the Rosie Spinning Photo Tops! 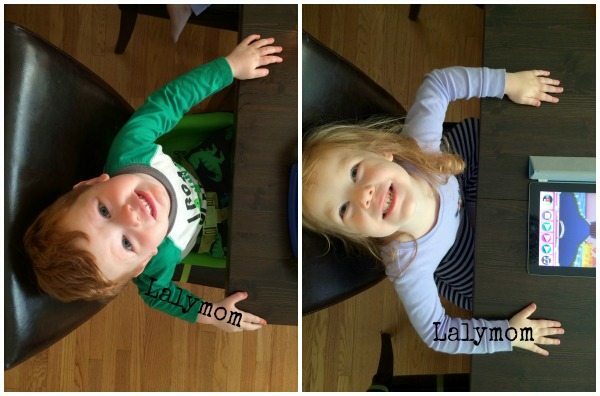 This is our second time joining Sugar Aunts for their Classic Nursery Rhymes series! Often times children hold hands and walk or run in a circle while they sing the song, then at the end they all fall down. This gets repeated over and over at our house and YES I will join in and the kids think it's hilarious when adults fall down at the end of the song. So yes, the kids LOVED these tops! So here is the thing about these tops, they can be made a few different ways, and I really don't think any of the ways are too hard to do. I have a few ideas below to design your own Ring Around the Rosie CD. Once you design the CD using one of the methods below, you can build them like a basic CD spinning top, which I have seen around the internet. It's basically done by gluing a marble to the bottom of a CD and then gluing a bottle cap to the top of the CD. The white cap is actually a pouch cap from a Kabrita Goat Milk Yogurt Pouch. Or just go with the marble, the way Meaningful Mama did with her CD Tops. 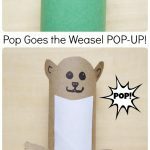 I only had hot glue at how when making these, but I saw on I Can Teach My Child's Best Spinning Tops post that Gorilla Glue is better. SAFETY NOTE: Marbles can pose a choking hazard for little kids and babies so you should use extreme caution and supervision with the marbles. We played with these tops with my 2 year old and my 4 year old and as soon as we were done I picked them up and put them away. At one point we were playing, since I only have hot glue, my toddler pulled one of the marbles off so we were done playing with them at that point. I'll pop it back on with gorilla glue when we get some. That said I would totally do it all over again in a heartbeat, the kids loved them so much! Here are a few ways you could make your own Ring Around the Rosie spinning top, including a step by step tutorial for how I created mine. I included some affiliate links to products that might help. 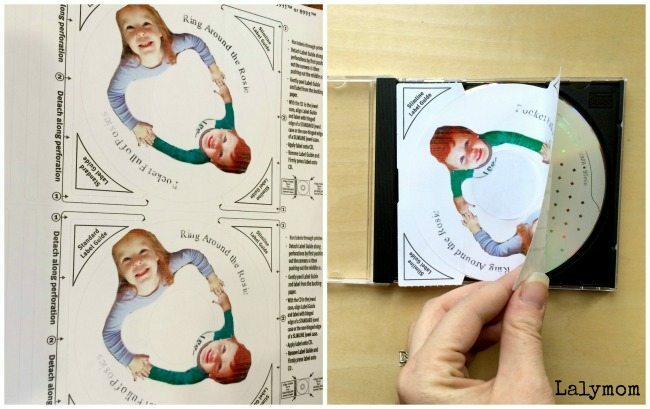 You could have your children draw right onto the CD's and draw pictures of themselves and their friends holding hands. If you want a white background for them to draw on, you can use the same white CD labels from Avery that I used. Have each child bring in enough photos of himself or herself so that everyone has one. 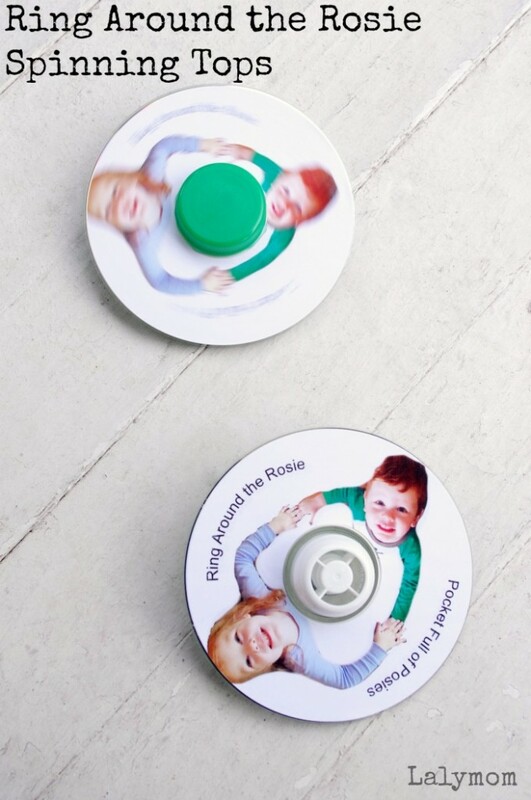 Cut out the pictures of the kids, or you could punch them out with a circle paper punch for uniformity. Next glue them to the CDs in a circle. Same thing, if you want it to have a white background you can use the same white CD labels from Avery that I used. I think they would be fine on the silver CD too though. I saved them on my computer as individual photos, just like normal. Then I went to Picmonkey. I selected Design, from the main page and created a blank square image. I added each of these images by clicking the Butterfly in the left menu (overlays) and clicking “Your Own.” When you add images or overlays you can use the Eraser feature to erase a portion of it. I used the Eraser tool to remove the background and then moved them so their hands overlapped. The next step was pretty easy thanks to the Avery online design center, which I discovered recently when I made our Old Lady Who Swallowed the Fly Printable. You select the product type you are using (specialty shapes in this case) and it will ask you to enter your name and email. I have not received any emails from them because I selected No thanks on the form. I think I'm in love with their online design tool though, so maybe I should buy some Avery stock! Ha! 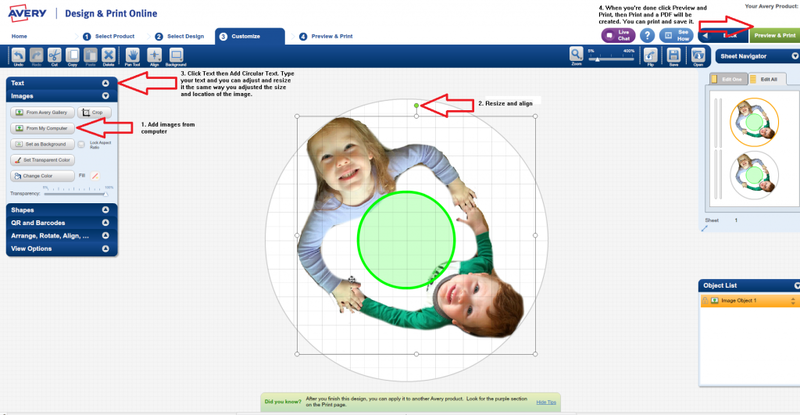 Once you select the template you need (5931 is the CD label template, according to the product box), you can choose a blank label and add your photo as well as text if you want. They even have a feature to add round text to fit the CD, which I thought was super cool! Here is a quick visual of the design steps, from start to print. Then when you print it brings up a PDF that you can save or just hit print once your labels are in the printer! Let your labels dry for a while so you don't smudge them. When you are ready, the labels have a super slick design so that you can apply them easily while they are seated in a CD case or on a round CD spindle. 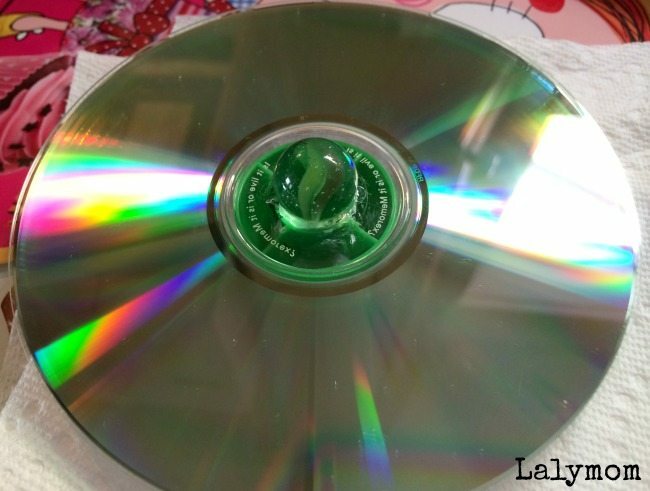 Once I had my CD ready, I hot glue the cap and marble to the CD. I found it easiest to put the glue on the cap, then center the cap on the CD. Next with the CD resting on top of the cap, I added the marble. Now you're ready to spin! Seriously, these things were so mesmerizing for the kids! SO fun! Like this activity? Please pin it! 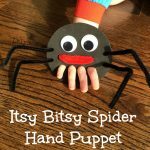 If you want more nursery rhyme and book activities, check out these posts and follow my Kids Book Activities Pinterest Board! 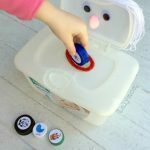 We are once again joining a group of bloggers led by Colleen at Sugar Aunts for a week of Nursery Rhyme Crafts and Activities, so be sure to head on over and see what the group has to share this time, and check out all the activities from last time as well! 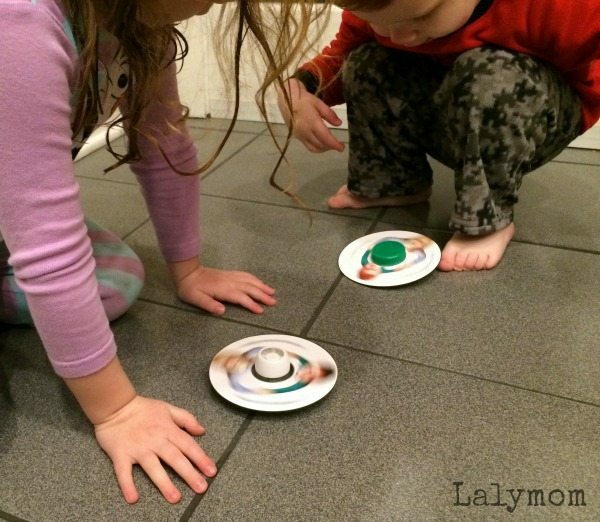 Previous Post: « Holiday Wishlist Reviewed: Top Gifts For Kids with Full Reviews! What an idea! Looks great, and thanks for it.